The male Y chromosome is the only chromosome that passes only from father to son, and not to the daughters. This goes the same way as family names do. To the daughters is given the family name, but they d'ont pass him on. So: In a family, all male members have the same Y chromosome also called Y-DNA. Adam, the ancestor of all people, has the original Y-DNA. In the course of time, hereditary changes tend to occur, called mutations. One kind of mutation called SNP is used in genetic genealogy. This mutation occurs sporadically, and can therefore be used to establish family relationships that extend over thousands of years. As a result of these SNPs, humanity has branched into groups. In the DNA we call that haplogroups. We now know about twenty of them. When a man with a new SNP has offspring, a new subgroup is created, also called clade. The ancestor of our family had such a new SNP and thus formed his own clade. Another type of mutation is the STR (Short Tandem Repeat). This mutation concerns the number of repeats a nucleotide pattern has on a certain Y-DNA segment. If there are fourteen repetitions on segment 393, we note that as DYS393=14. These mutations occur more frequently, and are therefore used to record family relationships in the shorter term, which span hundreds of years. Haplotype is the name we give to a group STR's in one person. In our clade, no lateral branches originated from then on until our ancestor. But in the region where we lived, few families have been tested. The oldest by name known forefather of our branch is Morees or Morech who lived in the fourteenth century. He owned land in the village Susschen near Maastricht. In the year 1388 he is mentioned for the first time, that is after his death. His widow payed that year the obligatory landowner's tribute to the Hospice of Tongeren. 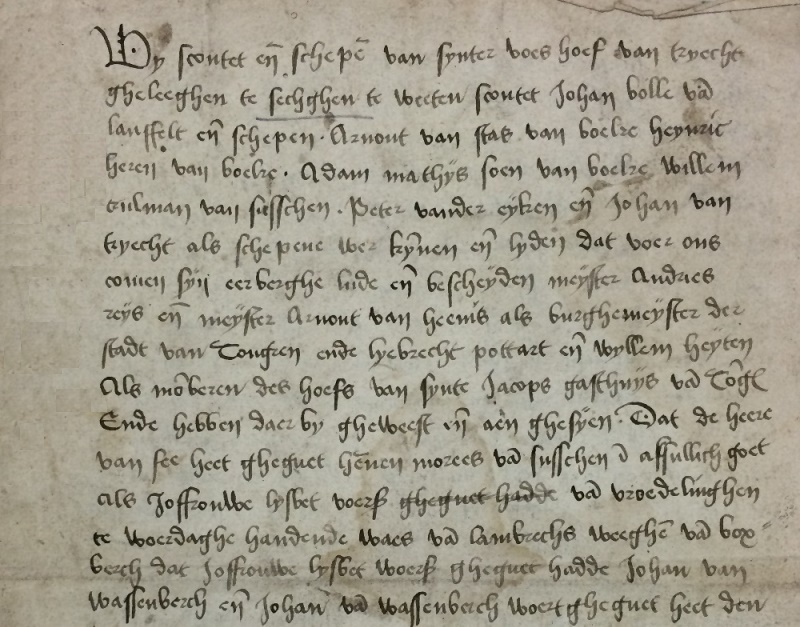 His son Johan Marres acquires, according to a charter from 1403, the old stock of the knights of Boxberch. Johan Marres (Hennen Morees) had seven children who reached the adult age. His son Reyner Marres is the ancestor of the Marres family. His son Johan Mees is the ancestor of a family Mees. They inhabit the Boxberch till shortly after 1495. In 1500, he is owned by Johan Tertres. DNA research can show to men with the name Mees whether they belong to this family branch. DNA research can show for people with the name Mees whether they belong to this family branch. The test YSEQ-Alpha for $58 at YSEQ is sufficient. 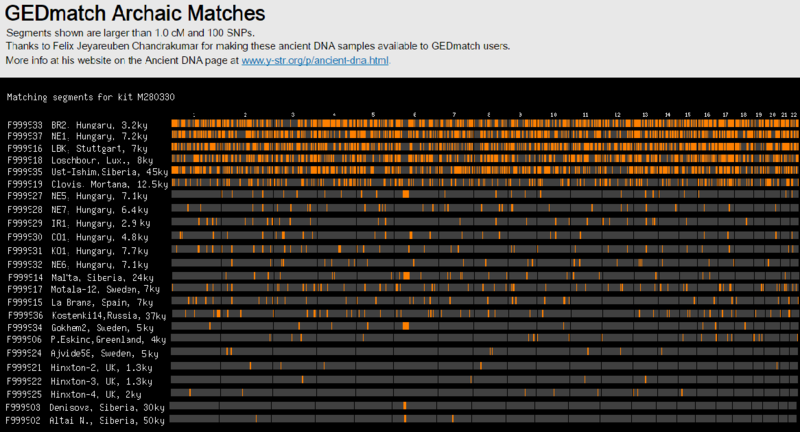 This are the results of the Y-DNA tests with 37, later 112 STR markers. We call these series haplotypes. Dys markers on a blue box - dys values in yellow - One genetic step in fawn - two steps in maroon. Genetic distance is the total number of STR markers that are different. Used is the infinite allele mutation model. The number of markers is in green. By FTDNA used mutation rate is 0.0054.
probability is 50% that the TMRCA is no longer than longer then indicated . average generation is is 32 years. The Average years of births of the paticipants is 1946. The values of the genealogical and genetic data are reasonably similar. In the article about the Marres family, published in 1990 in De Nederlandsche Leeuw, the ancestor of the Marres and Mares families is expected fifteen generations back. The genographic test estimates him between twelve and fifteen generations. This is within the expected time. In conclusion we can say that it is convincing proven that the four genetically tested persons: two members with the name Marres and two with the name Mares indeed have the common ancestor that is presupposed in the literature and that these families Marres and Mares are branches of one and the same family. Here follow the 112 markers (38, 30 and 44) of two members one of both branches. In the Big Y test in both men 552 markers were tested of which 508 had a result in both. Their genetic distance is 13 here. It is striking that in these 397 extra tested markers, only four were different. They share a genealogic first common ancestor who lived 14 generations back, so they a 13th cousins. Both distant cousins tested each 526 STR markers by means of a so-called Big Y test. This yielded a result for both of them in 480 markers, there are always markers that yield no value, No Calls. Remarkably, the number of different markers increased only by 2. The genetic distance between the two cousins, measured at 490 markers, is therefore 11. The standard group of 111 markers thus clearly has the amount needed to determine the genetic distance used to determine the degree of kinship and time to the most recent common ancestor. In the mitochondria of the body cells of all living things there is a relatively small amount of DNA. This comes from the female egg cell. It is thus passed on by the mother to sons and daughters, but only daughters pass it on, the sons do not. This Mt-DNA is determined in our family member E.C.W.L. Boed Marres. The ascending line goes from his mother over the families: Franquinet, Tielens, Corten, Becker, Geurts, Meyers, Peussens, Claessens, Deumans, Brants, Limpens, and so finally to the oldest known foremother Margaretha Geelen, born around the year 1570 who lived in Schinnen, South Limburg, 15 kilometers northeast of Maastricht. 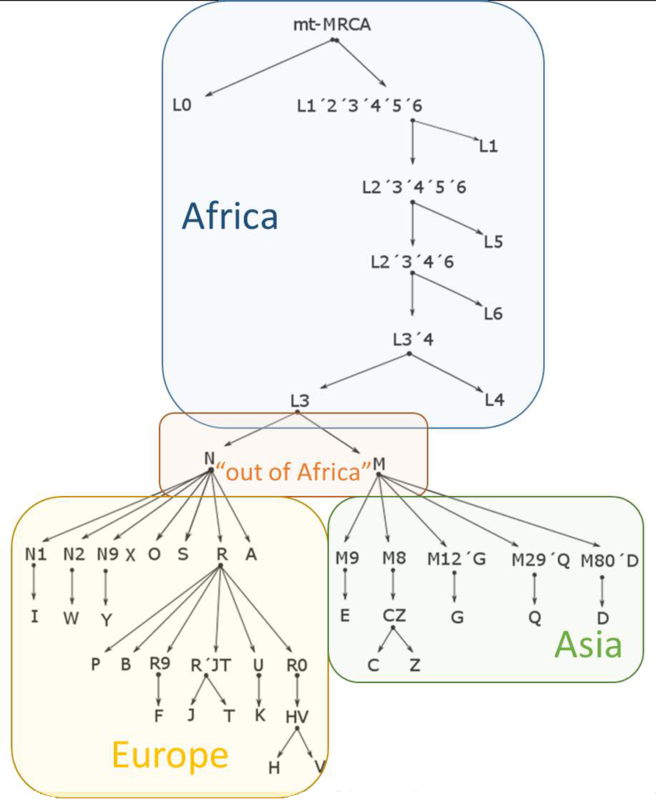 Mt DNA is also divided into haplogroups by analogy with the Y-DNA, although they are biochemically rather different. It has been tested at Full Genomes, at National Geographic in the GENO2 beta project, and at 23andMe. Genografic gives as result: haplogroup N1a'd'e'l. The companies 23andMe and FTDNA appoint him differently as: I1a1. These seem to have different results, but this are only other codes. Mt-DNA haplogroup I1a1 is most common in Germany and Switzerland, in Eastern Europe such as the Czech Republic, Poland, Estonia, in the Balkans in Slovenia, Bosnia, Macedonia, and Croatia, also many in Lebanon and in Ukraine. The beginning of the Mitochodrial Tree. With the mouse on the map there is an enlargement and green dot on Maastricht. My genome has common genes with mainly West Germans, starting with the people of Hessen and Baden-Württemberg, then mainly South Germany and Switzerland, followed by the Walloons, Northern French, Lorraine, Flemings and finally Englishmen from the South-East. In the first millennium of our era and perhaps even before, many peoples went from East to West Europe. And many residents of what is now the Netherlands, Belgium, Westphalia and Saxony went on to Great Britain. Many of course also lagged behind. My ancestors came all from regions more southerly than Maastricht. Striking is the lower share of Limburgers. Brabanders are poorly represented and the other Dutch are hardly there. When many use their genome for research in this way, this will make European migration history more clear. This is a group of geneticists who carry out the autosomatic tests for the large companies. They searched for origins from thousands of years ago with the original inhabitants of Eurasia. The oldest are the Altaic natives who stayed here on the tundra during the ice ages. After the ice ages around 10,000 years ago the hunter-gathererers who repopulated the European mainland from their refugia on the Mediterranean. The Neolithic farmers came from Anatolia 7,000 thousand years ago, and the Corded ware people Iron Age people arrived from the Caucasus 5000 years ago. The Huns also have some left traces. In archaeogenetics, 1 cM is the lower limit for kinship. The higher this number is, the greater the kinship, so with more and thicker lines. In the table below we are the most related to two Neolithic persons who lived 7200 and 3200 years ago in what is now Hungary. They are closely followed by a 7000-year-old discovery from Stuttgart, then a Luxemburger from 8000 years ago. Then a 45,000 year old find from Siberia and a North American Indian from 12,000 years back. His ancestors must not have crossed the Beringbridge not long before that time. Striking is the large genetic distance to English, Scandinavians and Spaniards Here we seem to have hardly any common ancestors. The least we are related to a Brit - at the very bottom - with whom we share segments of 1 or 2 cM in five places. A nice test is the presence of Neanderthal genes. 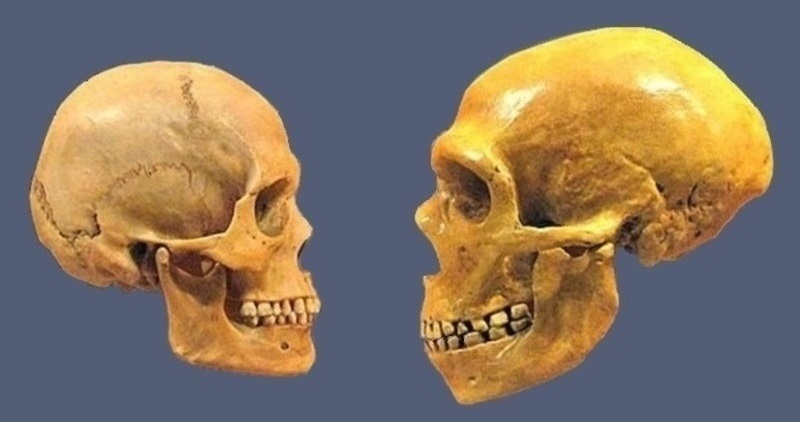 Our quantity is estimated, depending on the testing laboratory, between 2.8% and 4.8%, of which about 2/3 come from Neanderthals and 1/3 from another pre-modern human species, the Denisovans. Two Skulls, one of a modern man and one of a Neanderthal in Museum of Natural History in Cleveland. I applied the bimaxillary prognathism to the Neanderthal. At this Congress held in Maastricht in September 2012, Dr. W. Penninx pronounced the opening lecture. He discussed the variants in the Y-DNA of the various branches of the Marres family and how small mutations in the Y-DNA can show near and distant family relationships, which is impossible to do with only genealogical and historical research. He shows familial relationships that go back to the Middle Ages and even to the Neolithic. The results of the DNA tests in the Marres family serve as an example. 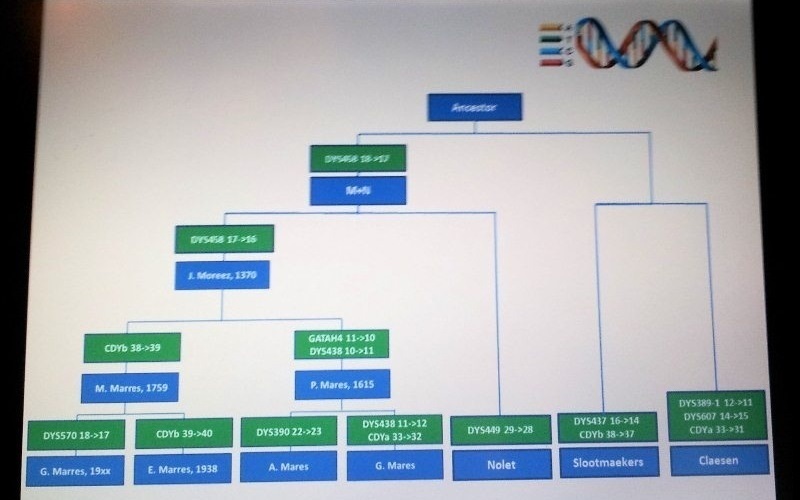 The motivation for launching the genetic study was our goal the expected but not yet proven genealogical relationship between the Dutch Marres and Mares families, if not to prove then at least with a maximum of security to make plausible. It has always been assumed that the Maastricht families Marres and Mares were two branches of one family. We were able to demonstrate this relationship with DNA research. When this goal was achieved, we used the genetic knowledge built up by this to find out our family history until prehistoric times. With the collected facts we hope to contribute not only to the national history of our country but also to the European and world history.